I originally found this idea in a 2009 Cooking Light magazine but since then, I've used it several ways and made several adjustments to it as suggested below. However, the fact stands that the dough recipe itself is absolutely the easiest one I have for real pizza dough or calzone dough - and it is delicious! It cooks up perfectly with just the right texture and you would think you are eating take-out pizza. Keeping it in a vegetable-sprayed zip-lock bag is a great idea and it freezes well that way too. I found that the recipe was a lot for calzones (unless you want larger calzones) so I split the dough into the halves, froze one for pizza another day, and then made smaller calzones. Those also froze well. As in all things I make, I always recommend making it your own recipe. Have fun with it and try different variations of it. The basic recipe is one that is basically foolproof. 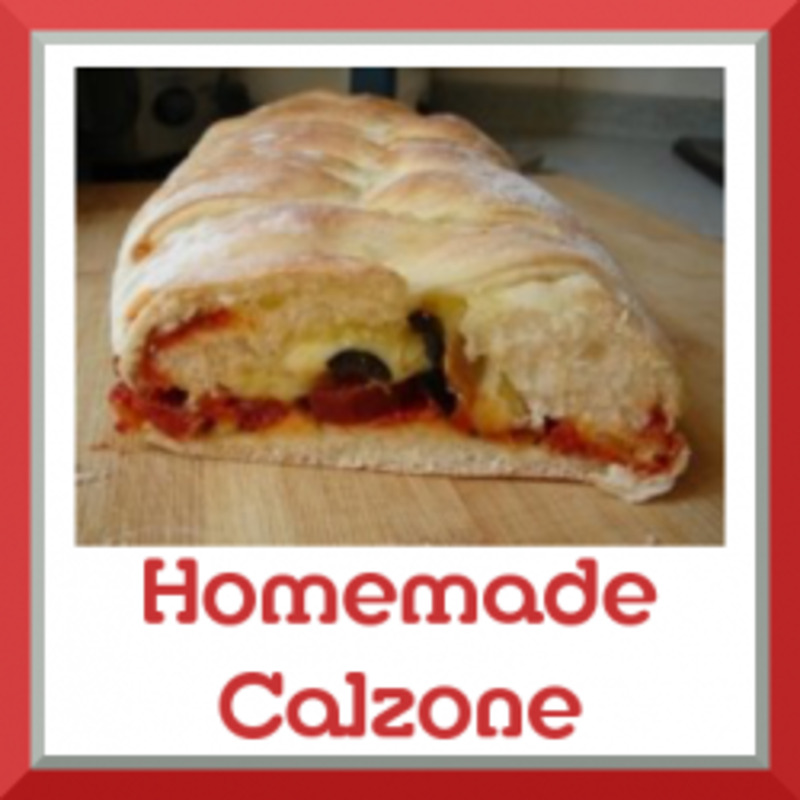 When our kids were growing up, our son Patrick especially loved calzones so this was always a favorite at our house. You can also vary it up to resemble hot pockets by substituting other ingredients - again, let your imagination be your guide. Dissolve yeast in 1 cup warm water in a small bowl and let stand for 5 minutes. Combine 1-1/4 cups cold water, oil, sugar and salt in a small bowl and stir it with a whisk. Combine 5-1/4 cups of flour with the yeast mixture and cold water mixture in the bowl of mixer that has a flat dough attachment. Mix this on low for 8 minutes or until the dough begins to form. Mix on low for 6 minutes longer until dough is smooth. Knead the dough either by hand or with the mixer for 2 additional minutes adding the remaining 1/4 cup flour – 1 tablespoon at a time until absorbed. The dough will be slightly sticky when done. Using cooking spray, spray the inside of 2 large zip-lock bags. Divide the dough in half and place each half in a zip-lock bag. Seal and chill overnight – or for up to 2 days. Set out on counter for about 1 hour before using. You can freeze both or one portion of the dough in freezer safe zip-lock bags up to 2 months. Thaw the dough overnight in the refrigerator to use. 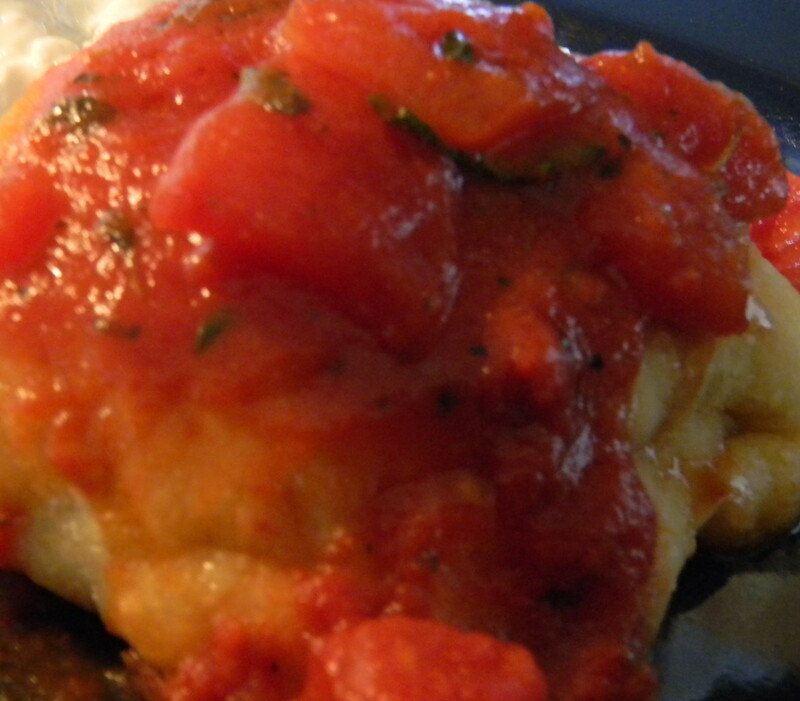 This recipe too was from the same article and you can vary it as well - it is a New York style pizza sauce or calzone sauce and it is delicious! Stir together all ingredients with a whisk. Use about 1/4 cup at a time for pizza or topping for calzone (or to your liking). Freeze any leftover or keep in refrigerator if using in the next few days. Good rule of thumb on herbs such as basil or oregano, etc. 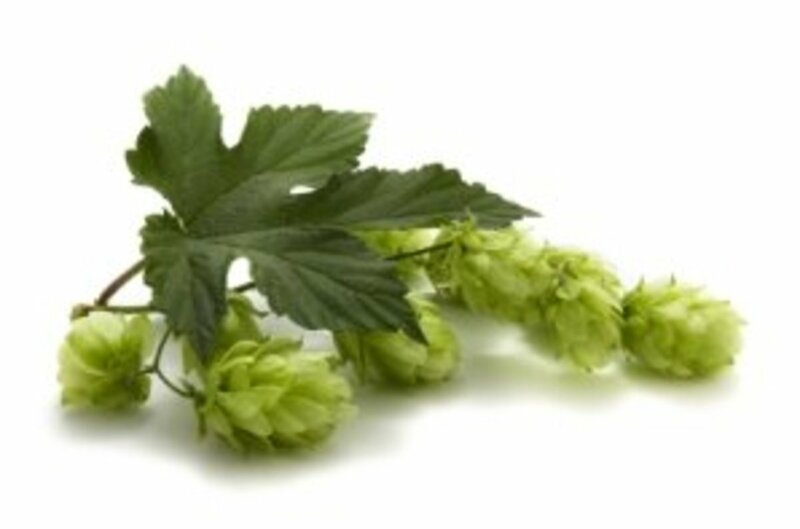 - if you are substituting dried herbs for fresh, you would use about half the recipe's amount. 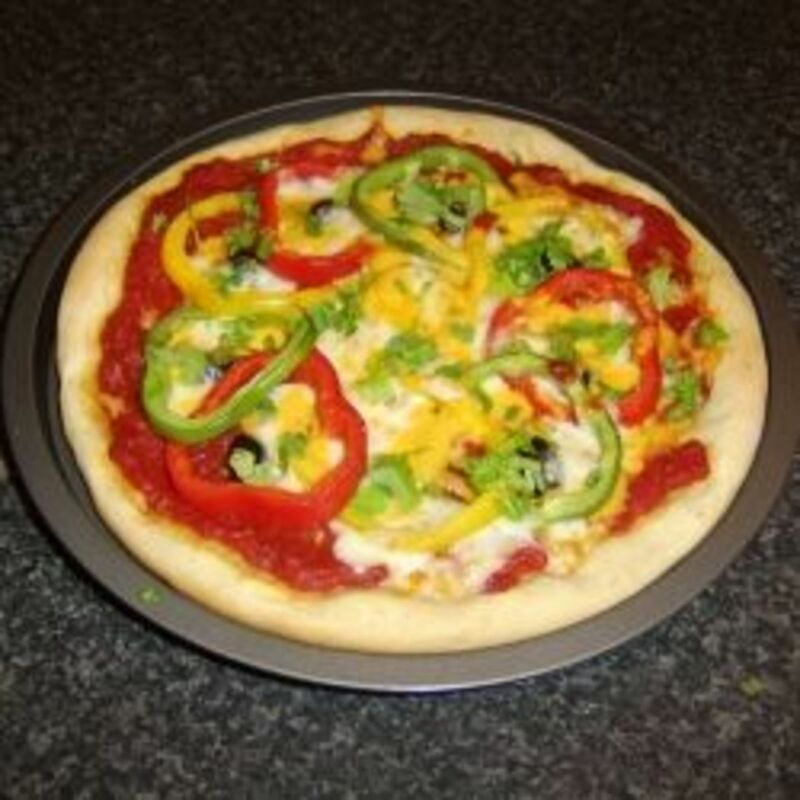 Use pizza dough that has been standing at room temperature for 1 hour – or if frozen, make sure it has been thawed and then stands at room temperature for 1 hour. Grill or use large skillet coated with cooking spray to sauté onion slices and bell pepper. If using sausage links, grill with vegetables on the grill about 4 minutes on each side or until browned. Grill sausages 8 minutes more turning occasionally. Remove the vegetables and sausages from grill and cool slightly. Cut onion slices in half and cut peppers into strips. Cut sausage diagonally into thin slices. 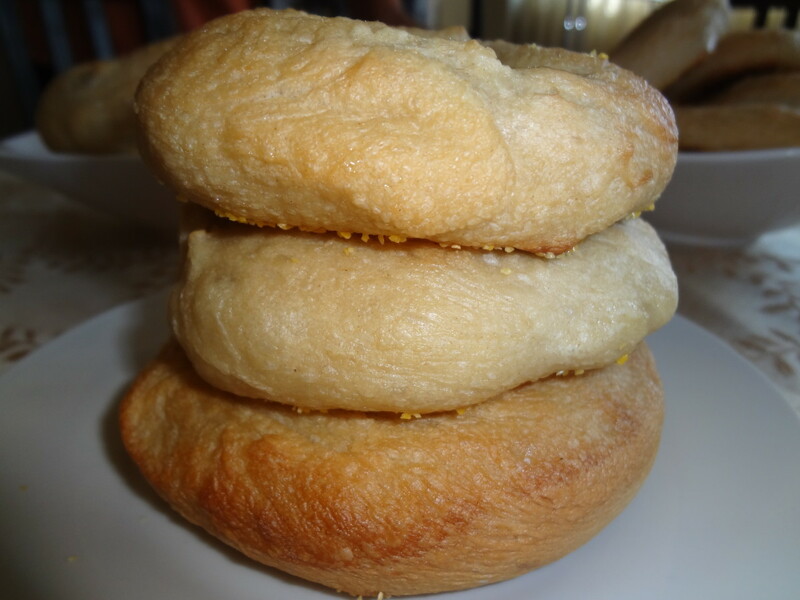 On a lightly floured towel or surface, divide the dough into 4 equal pieces. Roll each portion into a 9 x 5 inch rectangle. Spread ¼ cup of pizza sauce evenly on the rectangle but leave a ¼ inch border. Arrange sausage over half of the rectangle – top with onion and peppers. Sprinkle calzone with 1/3 cup cheese. Fold other half of dough over the filling, and press edges together with a fork to seal. Make rest of the calzones and then place the calzones on a baking sheet sprayed with cooking spray. Spray the calzones with cooking spray. Cut each calzone in half – serve with remaining pizza sauce. Substitute vegetables: I did not have any Italian sausage on hand and I cannot eat peppers so I went with a mixture of sweet onion and then crisp poached some asparagus and broccoli – added some mushrooms and spinach and voila I had great calzones! Now if you want to use the dough for pizza, again, let your imagination guide you. Last night, I used 1 portion of the dough that was in the freezer and spread it on a pizza pan lightly dusted with cornmeal. I patted the dough out to fit the pan and made a bit of a lip for the edge - then lightly brushed the entire surface of the dough with olive oil. I then spread some of the pizza sauce on, sprinkled a wee bit of Parmesan cheese on for good measure, then used Canadian bacon thin sliced and quartered, slivers of pineapple (tidbits) and topped the whole thing off with some low-fat mozzarella cheese. I baked the pizza at 425 degrees for 10-15 minutes and it was better than pizza from the local takeout! This is my favorite dough recipe for pizza and calzones. It is so simple to make and it truly rises just the exact amount that it should and has excellent flavor. I have made many doughs in the past but this one really stands up to the dishes I need it for. 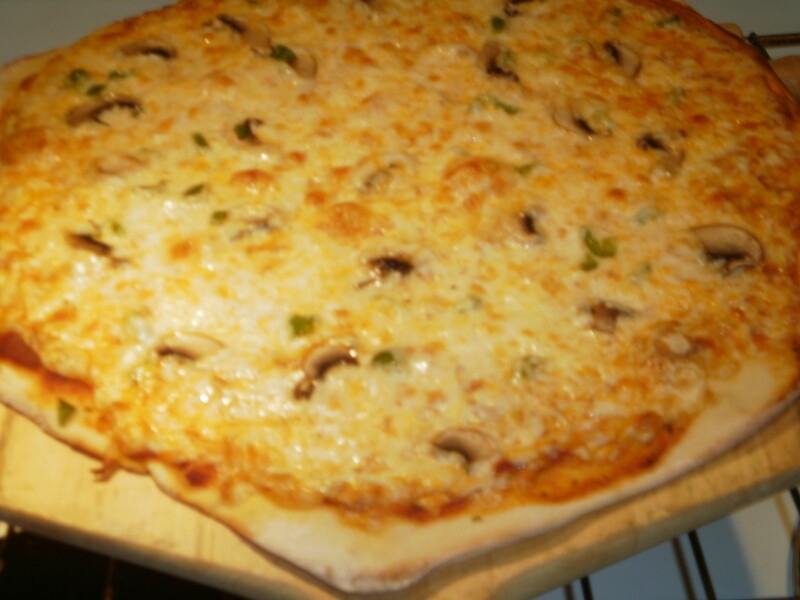 Whether it is a pizza you are making from scratch (it only took me 10 minutes to put the whole thing together and that included the chopping) or calzones of all various kinds and flavors, I think you'll agree - this dough is the best! This is just great. Always wanted to find an easy pizza dough recipe. Thanks for sharing and passing this on. It is, it is and love that it freezes so well. Thanks so much for stopping by! This sounds delicious and certainly easy enough. I've been using a no-knead dough recipe for a while (it's even more basic), but I think I'll give this dough recipe a shot sometime soon! Thanks for sharing this. You are too clever Nell and I know you could do it! Thanks prasetio30 - hope y'all enjoy it - I made a part wheat version last night and it turned out really good, too! Pizza is one of my favorite food. Italian pizza is the best. My sister made and sell mini pizza. I'll show your recipes to her. Thanks for share, I think these pizza was delicious.....yummy. You make me hungry, my dear! Thanks, Holle - and the best part is this one works! I love empanadas and the dough would be great for those, too. Thanks for reading and thanks for the idea, too. I make calzones all the time, but I've not thought to make them more pizza like. My calzones are more like Italian empanada. Thanks for the ideas. I love calzones but they are soooo fattening. I make my pizzas using Pillbury dough I'm ashamed to say but might try the dough recipe here on my vacation from work. Too hilarious....it is easy to make believe that it is good for us - but all things in moderation it actually IS good for us! Thanks for reading Bkcreative as always. Yes yes and yes! And that calzone sounds mighty good, I'll try it! Nothing beats the fresh. I will make it, bake it and go off and eat it all. I never feel guilt with good homemade food no matter how much I eat. Thanks so much! Thanks, Darlene - I am, therefore I cook! I think it just relaxes me somehow and takes me away...like Calgon so I keep looking for the 'ult' recipe. Thanks so much for commenting....try it - y'all like it - and I love the idea of everyone showing up for dinner! Thanks for stopping by. Love the name, love the bread. 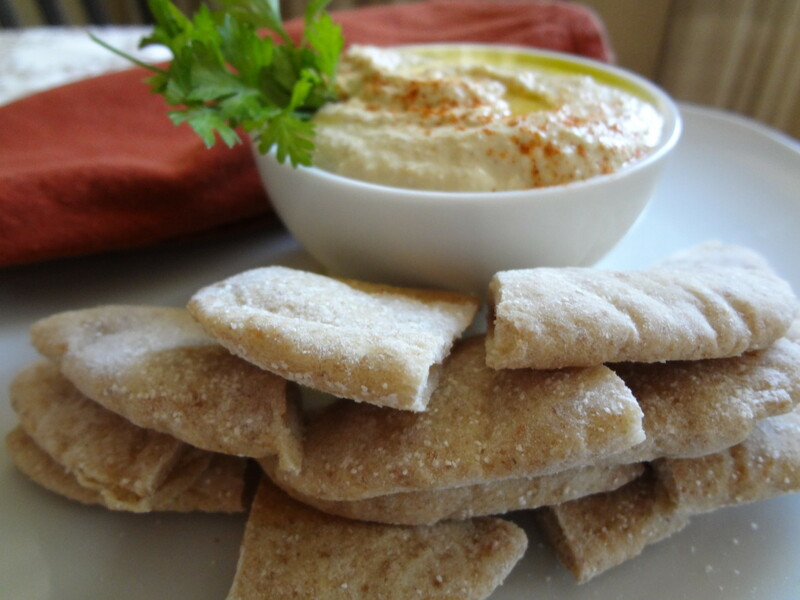 Bread dough is very versatile. And easy to make. And cheaper than bought. And better. You did good!